Here are some videos Jay made for our Rain Station DARK RIDE CD. Enjoy and please, purchase the CD if you haven't already. It is available for download on iTunes (here), at Bandcamp (here) and for a physical copy of the CD pick it up at 13thTrack.com Halloween Radio (here). Along with posting brew reviews, music, food and other seasonal things I am finding some great (and not so great) YouTube Halloween items. Who doesn't love a little old time Halloween music? Pumpkinland Halloween Haunt CD Great For Home Haunting! Creepings and salutations...you know I can't go a Halloween season without making a plug for my Pumpkinland HauntScape. "Musical director Mark Harvey was motivated to kick start a compilation of truly frightening sounds largely out of his disappointment with the usual mix of cackling witches and rattling chains. 'I wanted something dark, eerie, spooky, mysterious and otherworldly,' he writes in the liner notes that accompany this CD. Pumpkinland is his first shot at your nerves, a throbbing soundscape of ambient noises and ghostly synths based around five musical themes (Swamp, Ghouls, The Pumpkin Patch, Creature). A definite atmos-fear is set, more serious in tone than campy or fun. Still, Pumpkinland would probably work best as the aural counterpart to a thrill ride or Halloween haunt (as was intended) rather than an album to listen to in its own." "Are you looking for the perfect background music for your Home Haunt? Well, we found it! Pumpkinland Studios created the Pumpkinland Halloween Haunt CD specifically as a soundscape for Home Haunts and Halloween events. It's wonderfully terrifying. Not the lame sound effects disc you get year after year. If you really want to create a spooky atmosphere for your Halloween event this year, get this CD! We love it and highly recommend it!!" "There is no beating around the bush about this CD. If you are looking for a truly spooky Halloween soundscape that you can play during a Halloween Haunt, gathering, or to play for trick-or-treaters, the Pumpkinland CD is one that you should consider. It took a true Halloween enthusiast to come up with this CD. One of my favorite things about the tracks is that each track keeps the theme throughout the entire track. There is no unwanted sound effects that could take away from your haunting experience. Pumpkinland will truly help create a very spooky atmosphere. There are 5 tracks on the CD (long tracks). 1. Pumpkinland (excellent) 2. Creature (excellent) 3. Swamp (excellent) 4. Ghouls (excellent) 5. The Pumpkin Patch (excellent). Each track is done so that there is an almost seamless transition if you use your "repeat function" on your CD player to loop a track for a continuous "theme". The recording quality and recording level is excellent. I am proud to have this CD in my collection. I will use the Pumpkinland CD in my next Haunt. I sincerely recommend visiting http://www.13thtrack.com/ and listen to a track or two." "Want to set an eerie mood for your Halloween event but tired of screams and sounds of torment? If so, try the hottest new CD this season, "Pumpkinland" from Nobody Records, a Northern California based independent record label. After years of buying the same old tired sound effects, Mark Harvey decided to create a "soundscape of terror". He's compiled some riveting tracks that are dark, eerie, spooky, mysterious and otherworldly. Our personal favorite is the extended final track, The Pumpkin Patch. It aptly recreates the mood for telling ghost stories, yard haunting, touring your favorite cemetery at night...or just having a party!" "Are you looking for another great soundtrack for your haunt? Mark Harvey, of NOBODY RECORDS, has produced an interesting mix of tracks that should appeal to Haunters in a variety of ways. The CD consists of five extended tracks hell-bent on disturbing your customers. The first three tracks are ominous tunes played with synthesized low-end sounds bound to make your sub woofers rattle! With these, PUMPKINLAND takes advantage of the proven psychological fact that states low-end frequencies can mentally unnerve you. The fourth track is a departure from the style presented through the first half of the CD. This track is a grand piece performed through the sounds of a pipe organ, mixing high and low end sounds, with an occasional added effect (I don't know how to describe it) that will cut straight through you each time it is played. The last track is filled with a mixture of sound effects, including wind, storms, and howling wolves. If you listen closely you can even hear a whisper in the background saying, "Buy UNDERGROUND ENTERTAINMENT." Okay....I made that part up. But, you can use this sound effects track mixed in with a musical track to develop an entire atmosphere for your haunt. 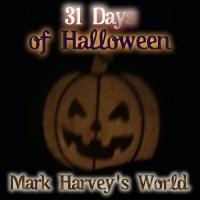 Mark Harvey produced this CD after many years of buying Halloween music and sound effects. He wanted to record what he had not been able to purchase. This dark and eerie album would make a great addition to nay haunt CD library." "...Pumpkinland Halloween Haunt CD by Nobody Records. This CD is all synthesizer sound effects and ambient sound textures designed to make your heart quiver like Jell-O. No punk, no hard rock, and no narration, this CD contains only ambient sound sculptures that can be used as the operator sees fit. The CD is wonderfully terrifying with 5 long tracks. The theme of each piece is kept the same throughout the entire track, and there is no unwanted sound effects that could interfere with other sounds you have in your attraction. Each track plays with an almost seamless transition on the "repeat function" of your CD player and the recording level is excellent. This 'soundscape' would be perfect for Halloween events and Home Haunts alike." "From out of nowhere, very spooky, comes this fairly simple soundscape which only differs from many of the others through the CO doorway by including some delectably odd Halloween related samples." "Your Halloween mood music is something I have been looking for quite a while. I have been into Halloween and have collected for over 30 years now and I rank it (Pumpkinland) among the best. It made me an instant fan." "I got your CD from E-Bay a few months ago and I would like to recommend it to anyone if they are looking for something for their Haunt. It is fantastic (Nobody Records Presents: Pumpkinland). I listen to it almost daily. It is the first CD in my stereo and it comes on whenever I turn on the lights in my apartment." "I've heard the mp3's and absolutely love it!!" "I want you to know that the Halloween compilation CD (Nobody Records Pumpkinland Halloween Sampler) has been in my 5-CD disc player ever since I received it so I have heard it countless times, and it truly is superb!!!!" or you can download the CD here.